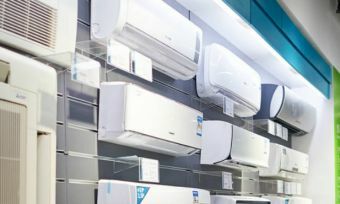 The end of financial year – which falls on June 30 – can prove to be an ideal time to look out for sales on household appliances, including vacuums and steam mops. Many retailers tend to start selling off their current stock to make way for the new during this time, so if you’re looking to upgrade your vacuum or steam mop, read on for a list of leading brands and what they have to offer in the cleaning department this EOFY sales times. Aussie shoppers typically spend an average of $338 on vacuum cleaners and $150 on steam mops. Some of the top-rated brands from our customer satisfaction research on both subjects include Bosch, Dyson, Miele, Bissell, Vax and Black & Decker. We’ve provided you with a list of models you might want to keep an eye on. 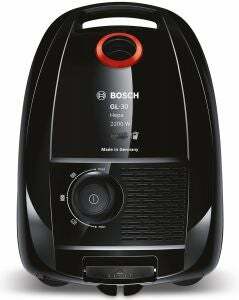 This Bosch vacuum is boasted for its washable HEPA hygienic filter, potentially ideal for allergy sufferers. Other design features include four swivel wheels for confident movability, an 8m cord with an automatic cable rewind and electronic variable suction control. Vax is the UK’s best-selling floor care brand, offering its Cordless Total Home vacuum for under $200. It’s said to have up to 22 minutes of battery life, which is a standard amount of time for a handstick vacuum in the mid-lower price range. For small units and apartments, this battery life might suffice but for larger households you might need to do a couple of recharges to get around the house. It does, however, take five and a half hours to complete a full recharge. Nevertheless, the main benefit of handstick vacuums is that they’re compact and easy to use. 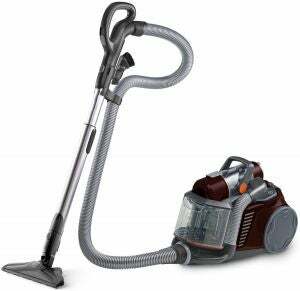 This VAX VX53P model is 4.8kg in weight and features a detachable handheld vacuum, seemingly ideal for vacuuming cars and couches. It comes equipped with a 3-in-1 Tool, hard floor tool, pet/stair tool and up-top tool for the hard to reach areas. 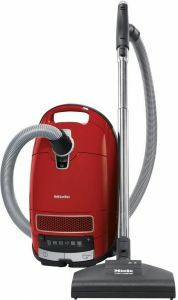 For a barrel vacuum option, you might consider the Electrolux 1600W vacuum ($649 RRP) with 1.6L dust container capacity. It features an automatic cord rewind for its 12m cord. It has a gross weight of 10.1kg, but features one multi-directional front wheel and large soft rear wheels for nice movability. Accessories included are a turbo nozzle, hard floor nozzle and an ‘AeroPro’ 3 in 1 accessory tool featuring a dusting brush, crevice nozzle and upholstery tool all in one. It’s boasted for its sealed filtration system and a HEPA filter, claiming to capture up to 99.99% of dust particles as measured by SLG – an independent testing institute – which could be ideal for anyone who suffers from asthma and allergies along with pet owners who find a lot of pet hair around the home. The twin inlet channels are designed to optimise airflow and suction, while the turbo cyclone spins the air at 140km/hr to separate the dust. It features five different suction levels to suit each surface, which can be selected through the LED display. 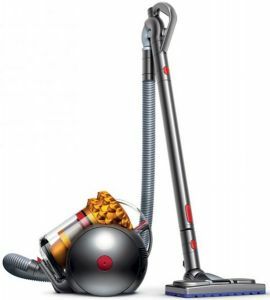 Dyson is known for its unique vacuum designs and technology, and when it comes to barrel vacuums the Dyson Cinetic Big Ball vacuum ($699 RRP) with 250AW of suction power might just be one to consider. Its main selling point is its manoeuvrability, with the design allowing the vacuum to maintain an upright position as well as provide quick changes in direction with the independently rotating wheels. The design also features a simple button release system to empty the vacuum, so no bags required and no filter to clean. The cyclonic action in the main vacuum chamber keeps the filter clean and places all the debris and dust into the removable debris bin. It comes with a 6.6m cord and weighs in at a rather chunky 7.7kg Accessories featured with this vacuum include a combination tool, a 1.25m stair tool to clean vents, fans and crevasses, as well as its ‘Musclehead’ floor tool which automatically adjusts to the floor type, allowing you to change from vacuuming carpets to vacuuming the tiled kitchen floor without stopping. The last on the vacuum list but not the least is the Miele Complete Cat & Dog PowerLine Vacuum, which is one of the highest rated on Appliances Online with a 4.9 consumer score from more than 25 reviews. It has a recommended retail price tag of $729 but may be found for less than $550 this EOFY sales time. It features thermal protection and a plastic strip to protect furniture and appliances against accidental collisions. Miele’s cylinder vacuum cleaner is claimed to provide a large operating radius, with a 7.5m cord length, plus a comfort cable rewind that has a single-touch control. The vacuum provides 2000W of power and is a hefty 10.1kg in weight. It’s boasted for the multi-stage filtration system that ensures clean air while vacuuming as well as helping to neutralise those unpleasant odours, ideal for pet owners. It comes with a complete range of accessories, including a stainless steel telescopic tube, upholstery nozzle, crevice nozzle, dusting brush and a park system on both sides for storage. Bissell aims to provide innovative solutions and offers a wide range of steam mops to choose from. An advantage of steam mops is that they use the power of steam to sanitise floors, so they won’t require chemical cleaners. 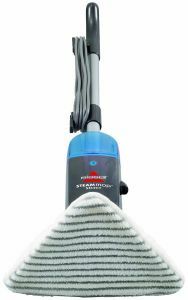 The Bissell 23V8F steam mop is fairly lightweight, weighing.1kg and features 500ml tank capacity. The Bissel steam mop provides 1500W of power, with steam temperatures reaching 100°C. Its height is 1149 mm. The model is designed with washable mop pads, triangular foot for corners and tight spaces as well as a steam on demand trigger. It includes one soft pad and one pad for tougher messes. Black & Decker stands at the forefront of home DIY projects, with a number of cleaning tools. The Black & Decker 7 in 1 steam mop ($199 RRP) is part of its deluxe series, featuring a detachable handheld and multi-purpose portable steam cleaner and accessories. Similarly to the Bissell steam mop, it claims to kill 99.9% of bacteria and germs with the power of steam – no chemicals required. It terms of design, it has a 650mm height and features an easy to fill water tank. It’s claimed to heat up in 15 seconds and comes with a micro fibre pad for “ultimate” pick up performance, boasted to last over 100 wash cycles. Should you buy a vacuum or steam mop this EOFY sales time? There are plenty of bargains to score around this end of financial year time. Well-designed vacuums and steam mops are not cheap, so if you get the opportunity to save a few bucks, it’s worth thinking about. The models we’ve listed above are just some of those on the market, so keep your eyes peeled for other big savings. However, the brands we’ve listed generally perform well in our customer research, so you are likely in safe hands. A few important considerations to think about before buying a vacuum or a steam mop is the weight of the appliance, its manoeuvrability and the additional accessories it comes with, allowing you to clean a variety of messes around the home. A good vacuum or steam mop can last for years, so it pays to have a good think about your needs and budget before getting out the credit card.